Step 2- Use wire cutters to cut top horizontal wire both left and right of each nursery container lift loop. Since fabric sides are only attached between lift loops, Fanntum fabric is now free to be cut and removed. Step 3- Vertically slit and pull down side fabric from top horizontal wire close to bottom horizontal wire. Fanntum's top horizontal wire easily pulls down with planter fabric, leaving lift loops intact and laced for easy moving of the plant container. Step 4-Dig a hole that is wider, but not deeper than the container. Step 5- Carefully set the root ball in the hole. The top of the root ball should be set 3" to 4" above the ground level. Step 6- Remove star lacing and end lift loops after placing your tree in the hole. For both easy planting and an environmentally friendly planting system, Fanntum's unique wire basket naturally decomposes in the soil. Step 7- Begin back filling the hole with the soil you dug out. Amending your soil is fine. Use a simple garden hose and and push it down into the soil around the newly planted root ball to soften the soil around it. "Slice" the soil around the root ball with a shovel to remove large air pockets from the soil. Finally, finish back filling the hole. Water well with a solution of Fertilome root starter. Step 8- Mulch the tree with at least a 2 foot diameter circle that is approximately 1" to 3" deep. Step 9- It is recommended that you stake the tree for approximately 1 to 2 years. Step 2- Measure the root ball twice. Dig a hole once that is wider than the root ball, but shallow enough so that the top of the ball will sit about 3" above ground level. It is best if the ball is sitting on firm ground so that the tree does not settle. (if the hole is too shallow or too deep, the tree is twice as heavy when you take it out to re-dig). Step 3- Fill the hole 1/2 full of water (after you are sure the hole is the right depth, wet soil is very heavy). If the tree has a wire basket, do not remove the basket (however, if it bothers you, you may cut away sections of the wire basket once the tree is in the hole). We caution you to be as careful as possible, though, because any damage to the root ball can severely affect the life of your tree. Step 4- If you have a deciduous tree, take the twine off the top branches now. If you have a conifer tree, wait until later. Carefully roll the root ball into the hole. Straighten your tree at this point, BEFORE you go to the next step. You now have the hard part done! Step 5- Before back filling your hole with soil, remove all twine or string holding the wire basket onto the tree. You can cut away portions of the burlap that you see, but understand that our burlap is designed to disintegrate quite rapidly. Step 6- Back fill the bottom portion of the hole so the tree will not tip over. Finish back filling with the soil you dug out. If you wish, you can mix in an amending soil at this time. Do not completely replace the natural soil. 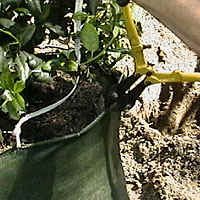 Use a spade to push in around the tree to remove all air pockets and tamp tight. Adding water at this time will help remove all the air pockets and allow you to tamp the soil tighter. This would also be a good time to add Fertilome root starter with your water. 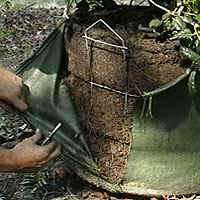 Take off the twine from the top of the root ball and remove the pins and cut the burlap from the top of the ball. 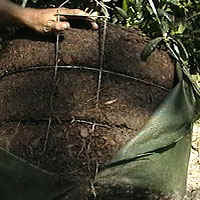 Step 7- Mulch the tree with at least a 2 to 4 foot diameter circle that is approximately 1' to 3" deep. Step 8- We recommend staking your tree for at least a year. Step 9- Sit down and admire your work. You did well. Water is imperative to a trees overall health and survival!!! 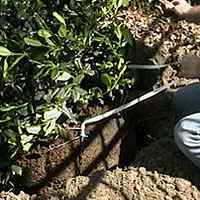 Regular irrigation after planting encourages rapid root growth that is essential for tree establishment. Some varieties of trees love water and the more the better, such as Birch and Bald Cypress, that being said, in some varieties such as conifers, (evergreens) and Oaks too much water can mean certain death. Most varieties DO NOT like to have their feet wet. They like adequate water and allowed to dry out some and then be watered again or have drainage so their roots are not always in water. 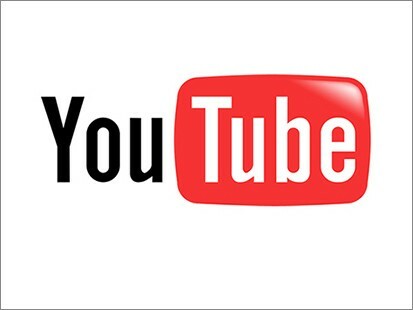 If the total root ball is constantly in water, oxygen will be robbed from the plant. If you need to plant a tree, except for Birch and Bald Cypress in a constantly wet situation, you need to plant the root ball higher (6”) above the ground level to allow the root ball to take in oxygen. 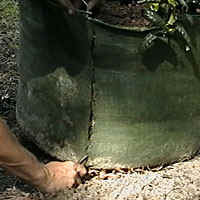 At each watering, apply 10 gallons of water per inch of trunk diameter over the root ball. If the mulch area is maintained weed-free, watering does not need to be applied outside the root ball, if the surrounding ground area is not extremely dry and robbing the moisture from the root ball. Once the tree is established (2 years) you can water twice per month in warm weather and once or twice during the winter during warmer periods that allow the water to soak in. Some varieties of trees will also benefit using a product as a root drench such as imipacloprid or Merit (trade name). This product is inexpensive and easy to apply each late Fall. Simply apply around the base of the tree and water in. The product will be taken up by the roots of the tree and make it unappealing to any insects or bores. Fall fertilization at this time is also giving your tree the supply of nutrients it will need to start out again in the Spring. Please contact us about different varieties of trees that could be affected and procedures for applying product. A healthy tree is one less likely to succumb to insects and drought.